(Newser) – In a New York minute, a Paralympic athlete's distressing experience turned into an inspiring one thanks to a smartphone app and the kindness of strangers. The New York Times reports on the plight of Zou Lihong, a Chinese wheelchair racer who beat US favorite Tatyana McFadden to win gold at Rio's Paralympics over the summer. 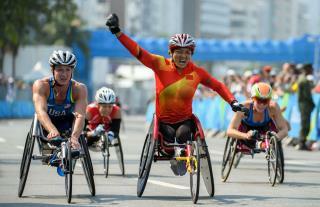 Zou was competing in the New York City Marathon's wheelchair division on Sunday when she got a flat around the Mile 13 mark in Brooklyn. Without a spare tire to get her back on the course, Zou was effectively out of the race—and stuck in a strange place, unable to speak English—but marketing rep Cecilia Daley, NYPD cop Krystopher Valentin, and software engineer Claudia Kulesh jumped in to help with some old-fashioned Big Apple graciousness. That's because NYers are awesome. Well, most of the time. Do you see those arms on that USA "woman" that came in 2nd in the photo caption! Dude those arms. Those delts, biceps, triceps. Thats not natural on a woman.